Tablet Counter Tablet Counting Device India, Tablet Counter Tablet Counting Device Manufacturer, Tablet Counter Tablet Counting Device Suppliers & Tablet Counter Tablet Counting Device Exporters in India. JLab is renowned Exporters & Manufacturer of Tablet Counter Tablet Counting Device & Scientific Lab Instruments India, Tablet Counter Tablet Counting Device Exporters, Educational Science Lab Instruments Suppliers India. Device for quick, convenient and correct counting of tablets. 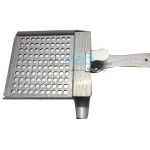 It is made of anodized aluminium sheet with pouring lip and handle.